403d Bombardment Squadron Colour Patch. (Pictured: The patch belonging to 403rd BS Pilot, 1st. Lt. John F. Deutsch). 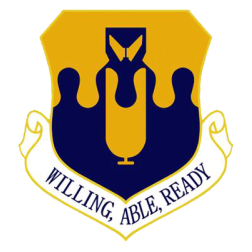 Established in 1940 and activated in 1941 as a long range reconnaissance squadron, assigned to the GHQ Air Force Northeast Air District. Trained and was equipped with both early model B-17C/D Flying Fortressheavy bombers. along with and B-18 Bolo medium bombers and A-29 Hudsons at Langley Field. Primarily flew training missions over the Mid-Atlantic States. After the Pearl Harbor Attack, was deployed to New England and began flying antisubmarine missions from Bangor Airport over the Newfoundland Straits and performing aerial convoy patrols over the North Atlantic shipping lanes. Deployed to Australia in February 1942, being assigned to the new Fifth Air Force being formed after the withdraw from the Philippines of remaining heavy bombers. The squadron reached Australia in March 1942 and was redesignated as a heavy bombardment squadron in April. Did not enter combat until September, when it finally had a reasonable complement of aircraft. From then until November 1944 the squadron operated in support of the campaign in Papua New Guinea, first from Australia, then from New Guinea and Owi Island, concentrated in particular in attacks on shipping. The unit experimented with low level skip bombing, using this tactic at the Battle of the Bismarck Sea, 2–4 March 1943 with some success. Between May and September 1943 the squadron's B-17s were replaced with B-24 Liberators, believed to be more suited to the long ranges of many Pacific missions. In November 1944 the squadron moved to the Philippines, helping the ground campaign on Luzon as well as conducting long range strategic bombing missions against targets in China and Formosa. Finally in July 1945 it moved to Ie Shima, from where it flew missions over Japan, still attacking shipping, as well as airfields and railways until the Japanese Capitulation in August. Squadron demobilized on Okinawa, aircraft being sent to the Philippines for reclamation. Inactivated as a paper unit in April 1946. The squadron was activated in 1958 as a result of Strategic Air Command phasing out the B-47 Stratojet, and additional squadrons were activated as part of the consolation of Stratojet wings, and the replacement of the B-47 by B-52 Stratofortresses. The squadron was inactivated on 1 January 1961 as part of the drawdown of the USAF B-47 force, with the aircraft were sent to AMARC storage at Davis-Monthan. Discontinued, and inactivated, on 1 January 1961.